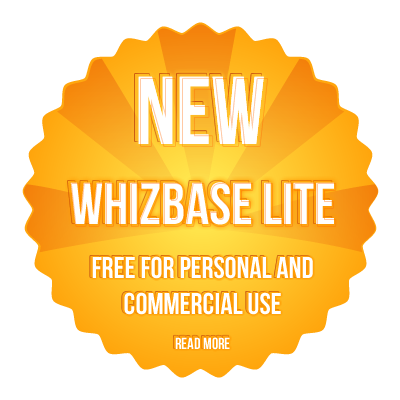 Why do I have to pay for using WhizBase? I have to pay for it? Well, yes actually, you have. But (there’s always a "but” somewhere), you could look at paying issue from other perspective. As we already mentioned, human labor, in this case working hours of your highly skilled web developers, i.e. - the time, is the most expensive part of web development process. And as all web professionals do know, in the world of web development time literally is money, so do you really want to waste it? Even, if your company can't find enough work, it still makes perfect sense to speed up your development process, because cost of development, in most cases, is calculated by time spent on it. So with faster development, you spend fewer hours on it. And fewer hours means smaller price with same profit for you. Obvious conclusion is - smaller prices mean that your services become affordable for wider customer base, and wider customer base (statistically) means more chances to get new projects. So, based on this example alone, sometimes it is much more profitable to pay for technology and save expensive man working hours, then to use free technology and waste precious and hard to find resources. On the other hand, our pricing for single domain license is very flexible with many discounts and promotional prices and various subsidies for interesting projects (we even offer free license for .org and .edu domains) so we’re sure that the price will never be a real issue.